The Tea Pairing 101 collaborative is back. Jee, Sara, I are enrolled in a tea sommelier course with International Tea Education Institute (ITEI) and we created Tea Pairing 101 to practice and to share what we are learning. 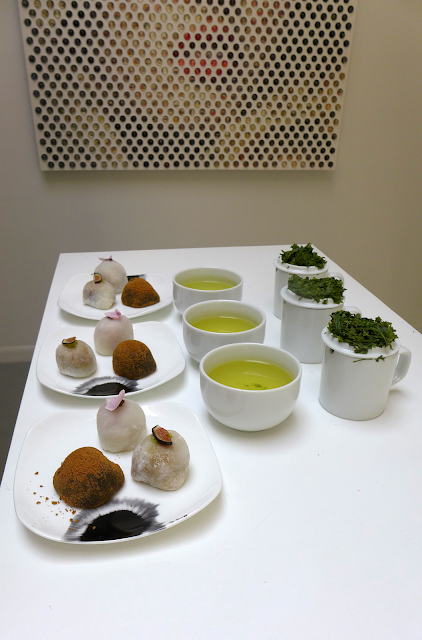 The first installation in the series was a white tea and cheese pairing. Today I will share our green tea and mochi pairing. If green tea has the longest history, why was white tea pairing our first segment? We are using a sequential approach based on two factors: the amount of processing Camellis sinensis undergoes after plucking to become a specific type of tea and the level of oxidation. 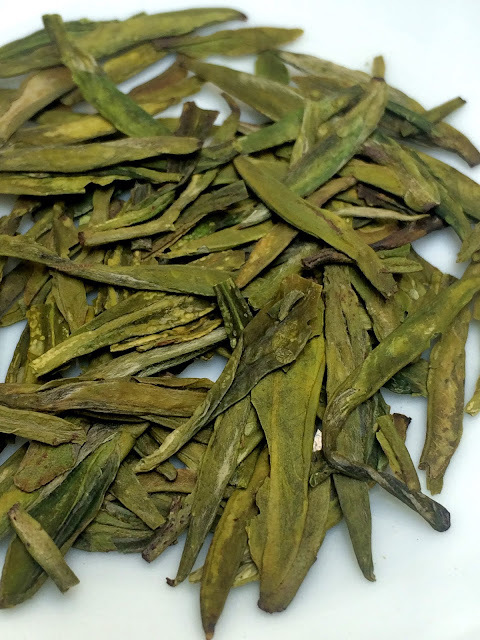 White tea is the least processed tea; there are two steps to make a white tea are withering and drying. Green tea is the least oxidized tea; the oxidase enzyme is purposefully "killed" early on in the tea making process by pan firing (Chinese process) or steaming (Japanese tradition). Lie Sangbong provided their skylit Blank Space art gallery for our tasting. On exhibit at the time of our pairing were portraitures by Dutch artist Nemo Jantzen. The green teas we infused are classic tea styles in their respective countries. I list them here in the order we tasted them which was based on the recommended water temperature for steeping. Mochi Rin provided three types of kofuku (or bite-sized mochi). We infused 3 grams of leaf of each tea in a professional cup for 3 minutes using the vendor's suggested water temperature. Three grams produced a robust cup of tea in each case. The dry leaves of this Hosen Sencha smelled deliciously and simultaneously savory, sweet, creamy, and malty. The leaves were flat and needle shaped and dark green in color with lighter green highlights. The shiny, yellow-green liquor was cloudy in appearance (as to be expected). The thick, full-bodied liquid was tasted of steamed asparagus. The wiry leaves of this Korean tea were many shades of green and smelled equal parts fresh, grassy, and of grains. The infused leaves exuded nuts. The yellow-orange liquor was medium-bodied with nutty and roasted flavors but a lingering sweetness on the lips. WHAT'S THE BEST MOCHI FOR GREEN TEA? 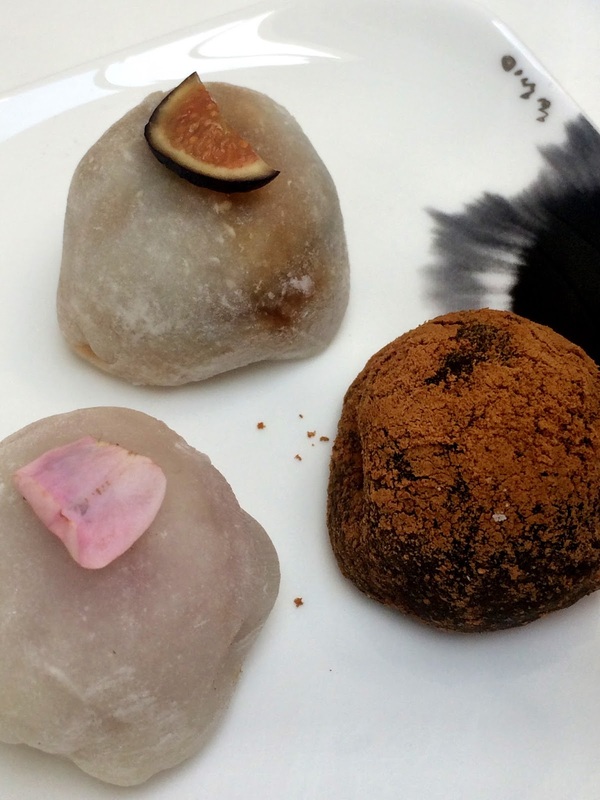 The fig mochi was the best in pairing for each green tea. Pairing fig and Sencha led to the realization that fig seeds are very flavorful. The Dragonwell was sweeter paired with the fig and the tea enhanced the dark sweetness of the fruit. The Woojeon-fig duo introduced the so-called "third flavor." Together, the pairing was earthy, in a good way. My second favorite mochi was the strawberry and it paired best with the Woojeon. Experimentation is important in tea and food pairing. Before this tasting, I would have been inclined to select something with savory notes to pair with green tea. The best of the pairing was fig, a deeply sweet fruit. Don't discard your savory preferences when thinking about green tea, though. Consider mixing sweet and savory/salty foods, for example a plate of fig and prosciutto, as an accompaniment to your cup of green tea. If you don't like either, look to what's in season right now. Peaches are peaking now, and baked peaches, I like the simplicity of a galette, have a similar depth of sweetness to fig. As always, thank you to my collaborators Jee and Sara. Read their tea stories at Oh, How Civilized and at Tea Happiness. P.S. For a digestible reference about tea, check out Tony Gebely's excellent summary of tea types, styles, and processing. 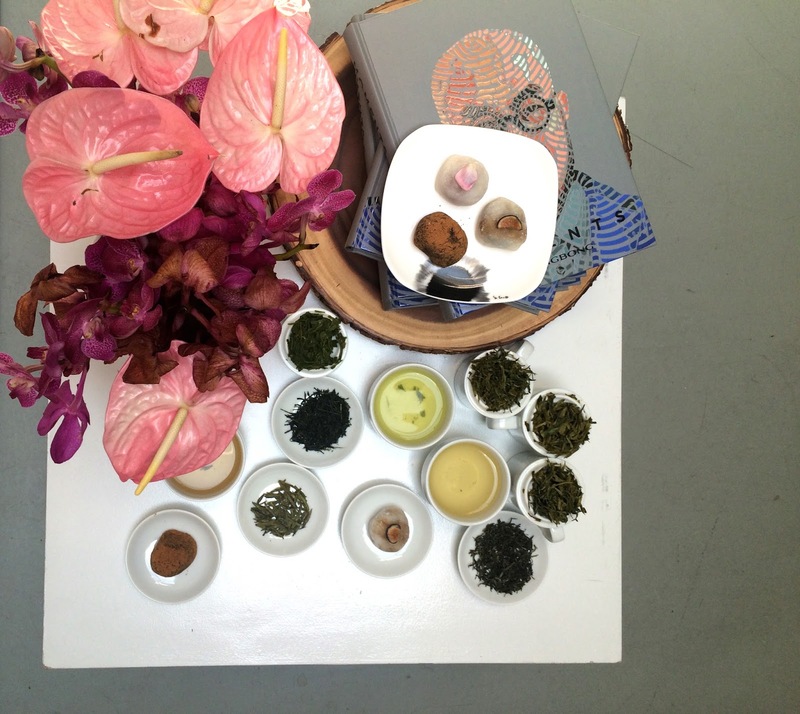 Are you interested in enrolling in a tea course with ITEI? Use the NOTESONTEA10 discount code when you register. Yes this trio makes us dream through their tea pairing sessions! and beyond dreams, they make us all want to try what they tried. I bet even the portraitures by Dutch artist Nemo Jantzen wished they could jump out of their comfy wall and take a tea sip and a mochi bite. Fabulous! Hi Georgia -- it seems people enjoyed my riff on your oolong pairing, so I thought I would work backwards and talk about your pairing experience with green tea and mochi cakes. The Facebook post will be going up this afternoon (Monday Nov. 6) at 5:06pm Eastern (Facebook.com/pairteas). Thanks so much for your interest and support! -- you three are amazing! I enjoyed your analysis of the oolong pairing, so look forward to reading your assessment of the green tea pairing. Thank you! I will definitely share via social media.